They can smell dangerous substances left behind for more than a day. They can tell if an individual has handled and even used a firearm based solely on scent. They use state-of-the-art training and techniques to assure a safe, healthy and welcoming school environment. They also crave treats, a couple scoops of kibble, multiple walks and leashed bathroom breaks. 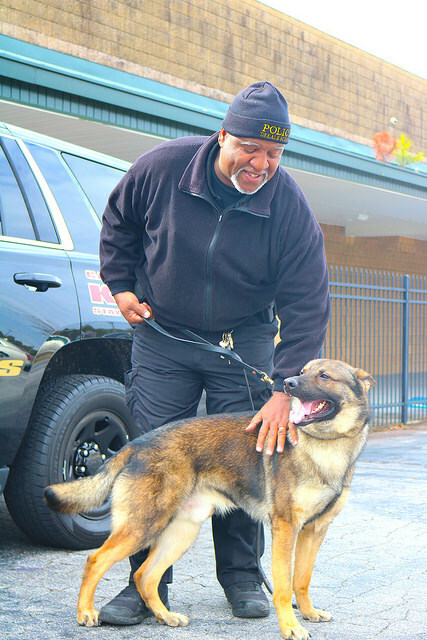 DeKalb County School District (DCSD) welcomed two new members to its Public Safety division in January 2018: K-9 units Rex and Rocky. The K-9s—tasked with locating drugs and weapons—are part of a new, comprehensive push for public safety at DCSD schools and facilities. According to DCSD Public Safety Director Bradley Gober, Rex or Rocky will visit a random school each week to assure no illegal substances or weapons are on campus. He said the K-9s act as a deterrent and are present to discourage harmful behavior. Rex, a German Shepherd K-9 Unit tasked with sniffing out drugs, possesses a sense of smell so strong that it can tell where someone that has used drugs has traveled. For example, if an individual uses drugs in the morning and travels throughout a facility over the course of one day, Rex can track his or her movements down to the step. 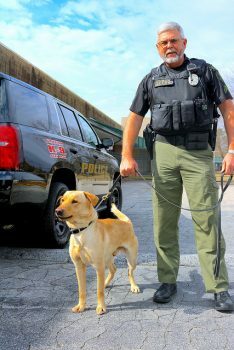 Rocky, a Labrador K-9 Unit that specializes in weaponry, possesses a similar asset. By singling out the components found in gunpowder, Rocky can detect weapons as well as who has been handling them. Gober said the dogs differ from traditional law enforcement canines by being non-aggressive. If the dogs become acclimated well enough, he said he hopes to eventually deploy Rex and Rocky to DCSD event gatherings and sport events. So far, Rocky has helped de-escalate a situation at Martin Luther King, Jr. High School. Similarly, Rex has already made an unannounced search at Lakeside High School. “We didn’t find anything, which is very positive,” Gober said. DCSD has employed the use of K-9s before, but had to cut the program due to budget restraints. Gober said the division has been seeking avenues to acquire the K-9 Units since September 2017 and plans to have two more by the 2018-2019 school year. Gober said it takes a dedicated public safety officer to handle K-9 Units, which are often hard to find. In addition to taking dogs to additional training at city- and countywide law enforcement agencies, officers typically have to welcome a new member to their family. DCSD Public Safety Officers John Brooks and Joseph Bielicki, who work with Rex and Rocky, have worked with K-9 Units before. The two officers said they appreciate having more tools to keep students, teachers and staff safe. Bielicki said the K-9 unit fits into his lifestyle at home, which involves horses and other farm animals. Bielicki said the dogs can actually act as a positive distraction for not only students, but teachers and staff. Bielicki said it’s hard to put into words and quantify the dogs’ positive impact on the district in the first month alone. “I can’t tell you how many guns have not come to school because we have a gun dog now. I can’t tell you how many illegal substances are not coming into school because there’s a fear of a narcotics dog coming through,” Bielicki said. Chief Gober said the new K-9 Units are part of an active effort to evolve DCSD’s sense of safety. He credits initiatives and support by Superintendent Green in allowing him to fulfill this mission. Gober said DCSD’s approach to safety has to change to keep up with a changing social climate. While DCSD already uses security cameras, web filters, and stations school resource officers at every school, more measures are being included in new school construction. To learn more about DCSD’s Public Safety Division, visit https://www.dekalbschoolsga.org/public-safety/. Click here to view pictures of Rex and Rocky. Roll Down Doors – The new construction of school buildings includes roll down doors that keep unauthorized or unwanted individuals off school property. Metal Detectors – Metal detectors will be installed at the entrances of five initial high school sites as part of a pilot security program. These schools include Towers, Martin Luther King, Jr., Cross Keys, Stone Mountain and Lakeside high schools. Parental & Staff Education – School resource officers plan to hold more sessions with students, parents and staff to speak about gangs and crime awareness. Additional officers will also be identified to undergo Gang Resistant Education and Training (GREAT) to help identify and connect with students who have possible gang involvement. Safe School Audits – A team of DCSD staff will conduct random audits to assist schools with the identification of on-campus areas that may need additional supervision. Such areas may be conducive to loitering or unwanted behavior.